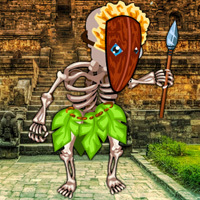 Wow Escape from Temple Island is another point & click escape game developed by WowEscape. In this game, you came to see the beauty of a temple island. But unfortunately, you missed the way out from that place. You have to find the way to escape by finding useful objects, hints and by solving puzzles. Click on the objects to interact with and solve puzzles. Good luck and have fun! Played this game earlier. Thanks WOW, this is one of your more challenging games. Tile hotspot in scene with ring door. Use grey stone on green face in scene with green spiky ball. Dip rose in green box of water. Eye dropper for red spill in scene with fire and anvil, then drop red stuff on spiky ball. Balls on seesaw can jump over each other. Pour 1/2 coconut on wall spot in scene with 7 balls. Sneaky sword in canoe, it's used twice. You only need 5 apples. Tongs from watermelons for green hole. Bowl of cookies for green pot in green hole scene. Lots of sneaky and translucent stuff all over the place. Also items hidden in plain sight on things of the same color, so look carefully. For instance, the sneaky axe head on bluish-grey stone in the first scene. Arrow for fish in water in scene with 6 pillars. Also, axe is used on those pillars. In scene with 2 white birds, pour cup on left bird. After you place 4 avocados and get item, pour cup on it for a clue. Oops....should be 7 *bells, not 7 balls. Sorry about the typo! don't understand the clue for the match x's? Ginner, highlight the pairs of matches that look alike in each group. You got the hint from a clue where two 3's were colored cyan (i.e., they matched). If I remember correctly, sticks were used to draw those three 4s. The criss-crossed matches were another puzzle. BTW, clue not needed for the chicken/egg puzzle. Just move the chickens till all the eggs light up. Stupid chicken and egg, wandered round for ages looking for clues, then had a paddy and bumped the chicks around, doh. Aww Sugarcrush, should have refreshed and seen your clue, saved myself a lot of swear words, good game though, some nice puzzles. Had to check the walkthrough for the blue and brown Xs - can someone explain?